We’ve got your buckles swashed!! 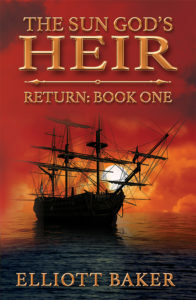 Tuesday, night, the 18th, join us to launch Elliott Baker’s new trilogy, The Sun God’s Heir, with Return: Book One. 6:30pm at the bookstore. The book is high adventure in the 17th Century with a dash of reincarnation and a side of Zen. It’s a ton of fun.